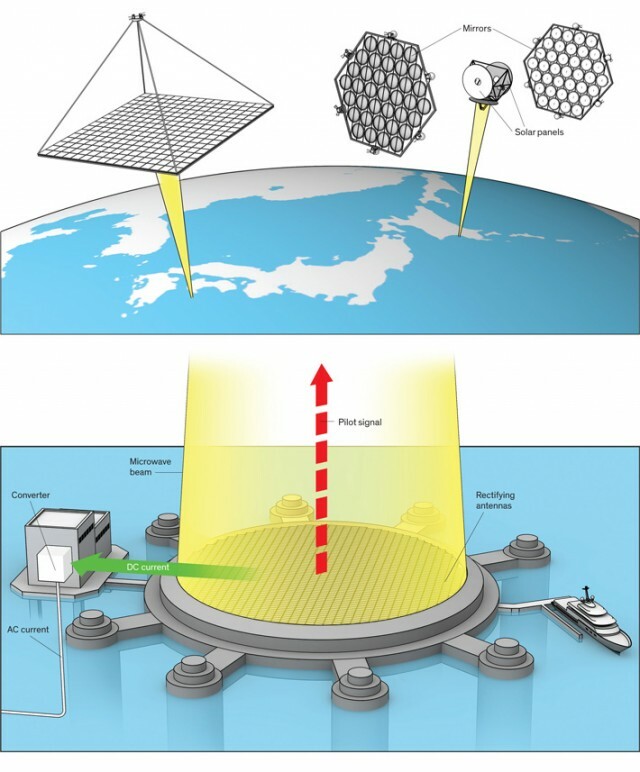 Scientists from the Japan Aerospace Exploration Agency (JAXA) have planned a series of pilot projects which, if successful, should culminate in a 1-gigawatt space-based solar power generator within just 25 years. Its energy output would be on par with some of the largest modern conventional power plants, thanks to fact that it’s above the atmosphere, which reflects or absorbs most solar energy that falls on Earth. Collecting solar power above the atmosphere means you could have access to almost 150% of surface amounts — and if we can find a way of beaming that power back down to Earth, our reliance on every other form of energy would vanish overnight. Here at ExtremeTech, we publish a fair number of articles about improvements to solar power. That makes sense since, until fusion power comes of age, solar will remain the only green technology that could even theoretically provide for our global power demands. The sun blasts our planet with so much power that the world’s deserts absorb more energy in a single day than the human race uses in a year. Yes, Earth’s surface is a phenomenal place to collect solar energy — but astronomers know about somewhere even better.